Drawing inspiration from Greek mythology and set in the bleak wilds of the Peak District moors, Adam Butcher’s atmospheric suspense drama The Prevailing Winds, sees a lone hiker brave the invisible threat of a deadly toxin carried on the wind to search for her missing sister. 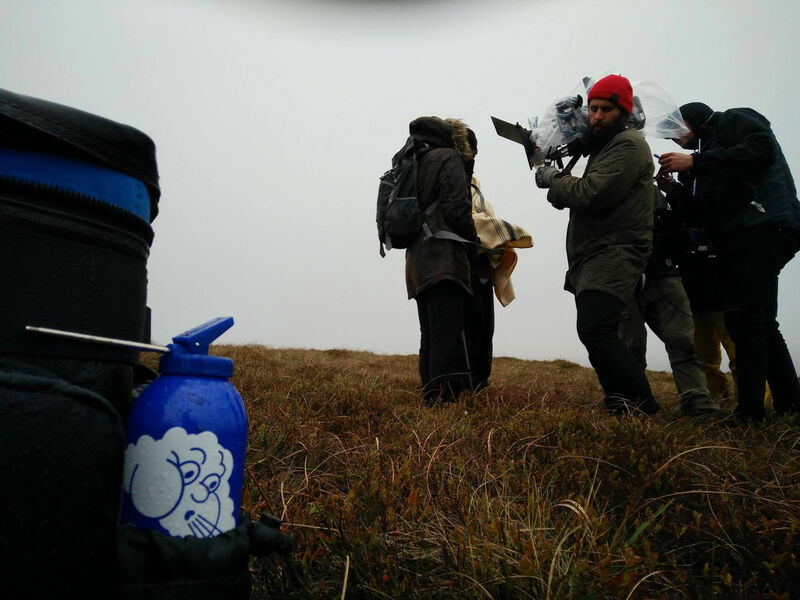 I spoke to Adam about meeting the directing challenge of an inhospitable location and how he used strong sound design to ramp up to the tension of this gripping walk into the abyss. How did you come up with the initial concept for The Prevailing Winds? The Peak District moors don’t strike me as the most hospitable of locations, how difficult was it for you to shoot there? We had a limited budget so preparation was key. As me and the DoP Michael Paleodimos were based in London we could only do so many recces to the Peak District before we’d run out of money for car hire! So every time we went up we took thousands of photos and made good guesses at how we might shoot the scene from rough storyboards. Together we’d place our favourite shots over a map of the location to help us get a sense of where to be, and used a lot of sun data to make sure things would look just right on the day. On the actual shoot the weather up there was crazy and very changeable, but we made it work. It actually helped differentiate the scenes a little and gave us some lovely mist for some of the GVs we were filming on the fly. Still, I’m glad the mid-summer blizzards only happened during our recces! What defined the approach you and Michael took to the film’s cinematography and how did that translate into your equipment choices? We wanted a visceral handheld look so that we could walk along with our actor and get in her face – but the actual terrain was way too rough for any real handheld walking shots! That’s where the Steadicam came in, but we made sure to still give it a ‘loose’ feel. We shot on one of the original Arri Alexas – a heavy old beast, but at least it came free – and I was really happy with the look we got. We really wanted to film on anamorphic lenses but sadly couldn’t afford them. Still, shooting on some spherical Cooke lenses and doing an anamorphic crop still came out really nice. It also helped us do some cheeky re-frames in post! The threat of death remains a disquieting presence throughout largely due to the film’s strong sound design and score, what was your process there? As the threat of the film was invisible, I knew that sound would be really important for the film. For that reason, I got in touch with the talented Alex Bingham who is both a sound designer and a composer. For a lot the soundscape, we used realistic sounds like wind and rustling trees but there were also weird ‘lateral-thinking’ elements like vocal whispers and buzzing flies. As the threat of the film was invisible, I knew that sound would be really important for the film. For the score itself, the process was very collaborative, sharing lots of references (from There Will Be Blood to Under The Skin to Channel 4’s Utopia) and then slowly creating the film’s unique sound. As I was in the edit, Alex would provide stems and that would help me and the Editor Napoleon Stratogiannakis ‘find’ the scene and draw out the tension. I’m still a huge fan of the score we created, it’s almost catchy! Lydia Leonard’s emotive performance carries us through The Prevailing Wind, how did you come to cast her and then together build her determined character? We were lucky to get a great Casting Director Emily Jacobs who helped us approach our cast and agents. Lydia is super-experienced and I’d liked her in previous things like Archipelago, so we just sent her a letter, the script and thankfully she was keen! As for the performance – thankfully we had time to get one rehearsal where we were able to discuss her character, workshop her relationship with her sister (which is really her driving force in the film) and then try out the two dialogue scenes she has. It felt a bit funny doing it in a rehearsal room, but once we were out on the moors it was great! My insight really is that if you get a real pro like Lydia you’re in safe hands. I’m moving on from shorts to the exciting land of feature film and TV. I’ve written a thriller for Western Edge Pictures (Prevenge, Third Star) and am currently developing a sci-fi TV series for a company in LA. But I’m also developing a bunch of my own projects that I want to make as my directorial debut – so if there are any producers out there, hit me up!